Vegetable Glucosamine. Suitable for Vegetarians and those allergic to seafood. Promotes Flexibility and healthy joints. Also approved in Japan and UK. 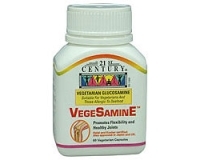 VegeSamine is a non-animal, plant source of Glucosamine derived from the plant Aspergillus Niger, different from other glucosamine derived from shellfish. Suitable for those with shellfish allergy. Glucosamine is a naturally occurring substance in the body important for healthy joints. It is a key component in the formation, maintenance and repair of cartilage – lubricant tissues that hold joints together without friction. Clinical studies have shown that glucosamine helps reduce discomfort associated with joint problems, stimulate cartilage cell-growth and improve joint mobility. Take one or two capsules after breakfast and one or two capsules after dinner. You may take more if prescribed by a physician. Contains: No sugar, starch, salt, artificial flavours, preservatives or Animal/Shellfish by-products..